Beautyandthesnob says: Destination Antwerp, Belgium is well known for being a port city famous for its diamond trade, and one of the most fashionable cities in Europe thanks to the 'famous 6' couture designers such as Dries Van Noten, Dirk Van Saene & Marina Yee. 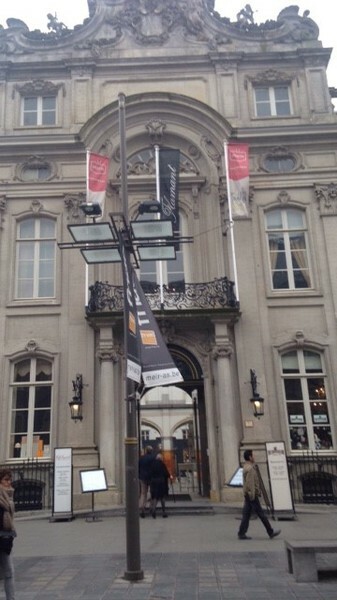 The city is also a major hub for high end couture brands from Hermes, to Louis Vuitton, to CHANEL. 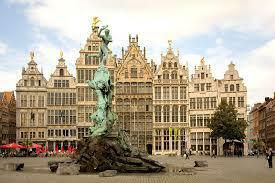 It has its own diamond district just at the mouth of Antwerp Central Station. 85% of the world's diamonds come from this tiny little place whether it is bought or cut there. The city is vibrant and full of culture homing the House of Rubens, MAS museum, and Fashion museum. As you enter the main street of the city you can't help but notice the chocolate shops that will be calling you. This particular chocolate shop is called the Chocolate Line (Address: Meir 50, 2000Antwerpen,Belgium) and was once the summer home of Napoleon Bonaparte. There are of course, unknown, more individual oldy worldy chocolate shops as well that are just as delicious and offer hand crafted treats. 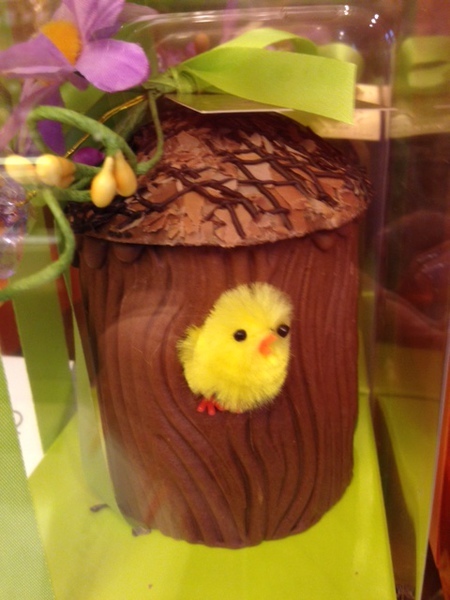 Here, we discover some of the Easter treats! 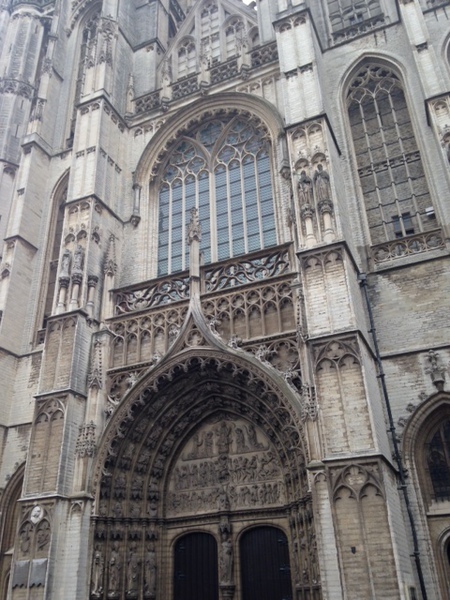 Enjoy and take in the city sites as Antwerp has many corners that are old and more religous while mixing in with the essentric and new. Corners of the streets displays major art works, and you may be surprised to find you have turned around a corner to find another small gallery or museum displaying modern art! The Cathedral Our Lady, a Catholic cathedral is also not to be missed and a must go to destination. On the outset the MAS museum looks like just another building with an interesting design. Known as the Museum Aan De Stroom, it is located on the river at the port. 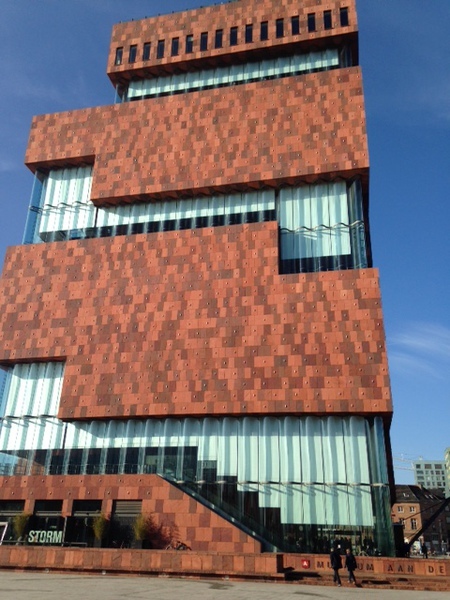 The museum has 10 floors that tells the story of the city of Antwerp thourhg its stories of trade, history, and diversity. Starting from the first World War straight though the present day, the final surprise is the panoramic view you can enjoy of the whole city as the reward. The tour of the museum is a delight and rather interactive if you have a smart phone or iphone as you can scan all the barcodes on the displays- which tell you about the display or the historical fact. The House of Rubens was once the family home to Sir Peter Paul Rubens, the great Flemish Baroque painter. You can see many aspects of what influenced Rubens in his works here, to how he had lived on this estate as a boy. The museum houses many of Rubens' great works, self portraits, and family membered portraits. If you love history, and want to see both his life and work, this is not to be missed! Essentiel, Antwerp is perhaps one of the best examples of one of many fashion stores in the city that matches the diamonds. Why? Well, take note, that most of the fashion is sparkly, sequinned, and has stone embellished accents. This store is a treasure trove for bright coloured pieces, fun and electic pieces, and anything that shines from lurex to gems on tops and skirts! 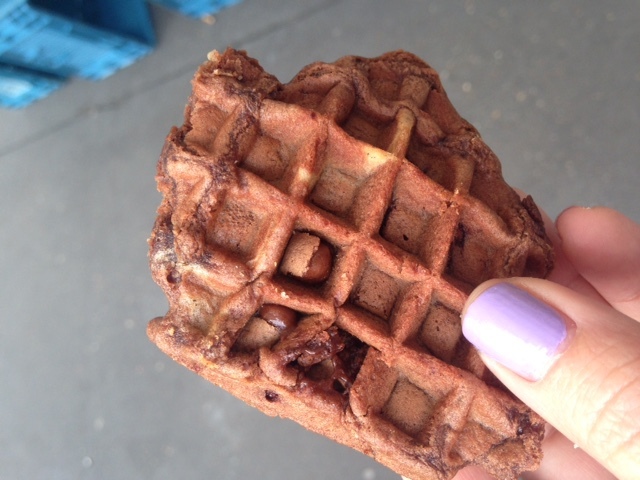 You will notice that tourists are enamoured and also rather obsessed about eating the famous waffle in Belgium. It seems that the locals in Antwerp are also equally into it as you will find fresh waffles everywhere on the street from stalls on radom corners to shops serving them with whipped cream and strawberries. I found these smaller versions at the local weekend market and of course, I prefer them with extra/double Belgium chocolate! Located at the Graanmarkt 7 2000 Antwerpen, BOURLA is a bistro that offers seafood, and more special meats like rabbit. Bring a big appetite though as servings are generous. Each night they do an extraordinary fixed price 3 course menu- The Menu Maman (Mother's Menu) offering their favourite dishes at good value. If you are wanting to eat well and at a reasonable price head to BOURLA! 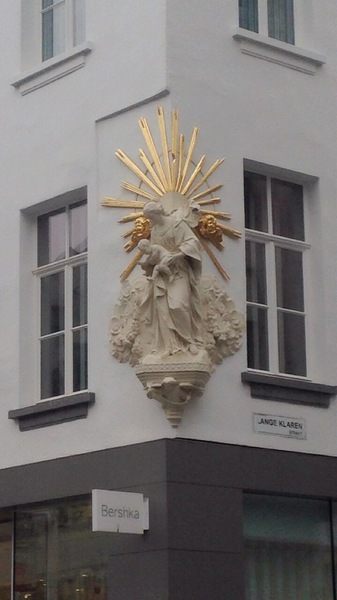 Besides the flemish cuisine are hidden gems on side streets of the city. Kioku is one japanese restaurants that show off Antwerp's magnificent seafood in large sushi boats, and light and crispy tempura dishes. Kioku's taste is authentic japanese rather than Flemish attempting Japan. I would recommend this either for lunch or a break through your trip one evening to get another taste other than traditional brasserie with steak or casserole dishes. Great value and quality!